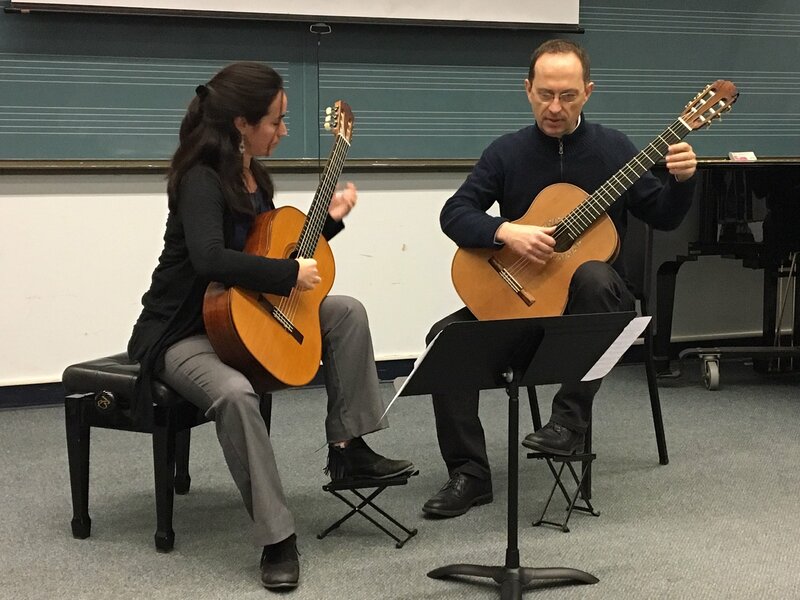 The Cavatina Duo outreach took the form of two simultaneous masterclasses at the UTSA Department of Music on Saturday afternoon, January 26, 2019. 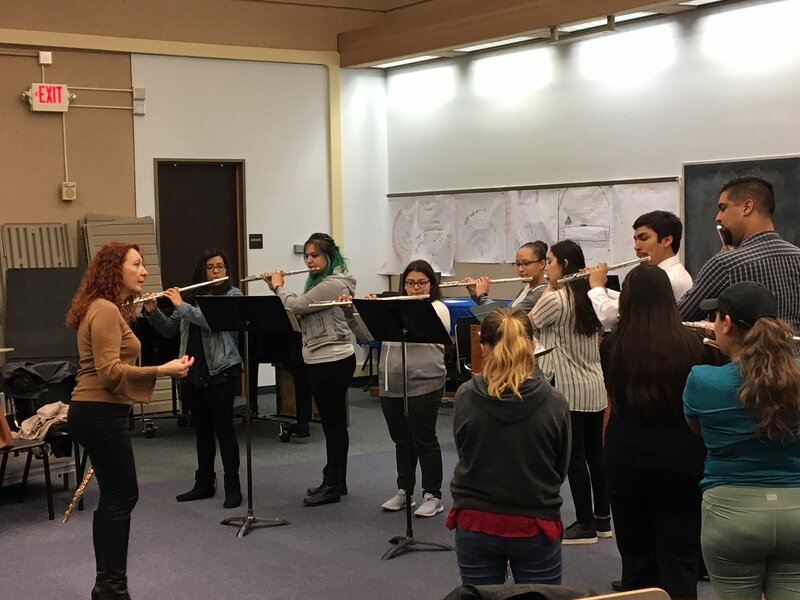 The flute masterclass conducted by flutist Eugenia Moliner began with group exercises for the ten students from the studio of UTSA flute professor Rita Linard. She positioned them in a semi-circle and worked with them on the art of breathing- air flow and control. Rapport was quickly established between Eugenia and the students: she spoke to them in Spanish to help clarify certain points, after discovering that most of them spoke Spanish at home. Then individual students played their prepared solo pieces, after which Eugenia gave each one constructive critiques and helpful pointers on air support, rhythm, dynamics, and tone production. She also gave each student a “prescription” for fixing specific problems – exercises to handle technical challenges. She impressed on them that only 10% of the flute’s sound is produced by the instrument, the rest is coming from inside the performer’s body – the “sound box”. 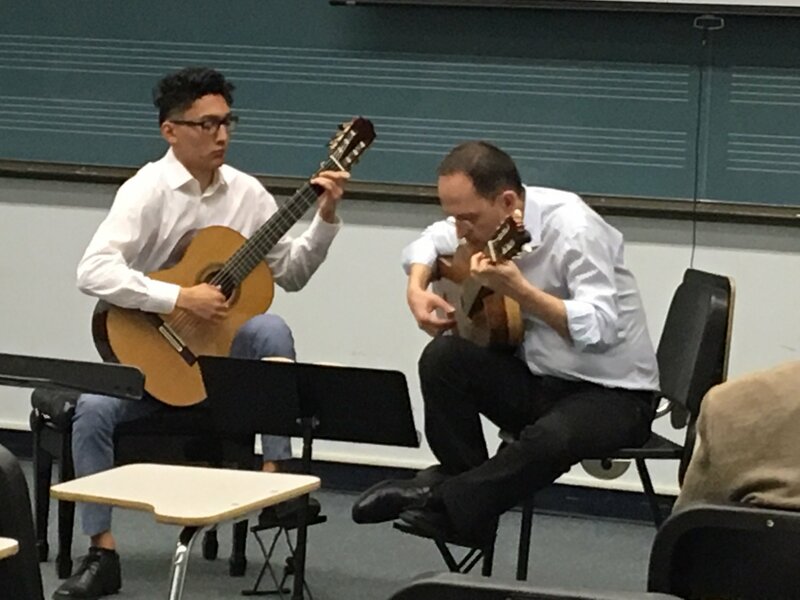 Seeing that many of the students were nervous about playing solo in front of the class, Eugenia told the students that they need to believe that the audience always wants the performer to do well – knowing that will help them relax and keep their anxiety under control. 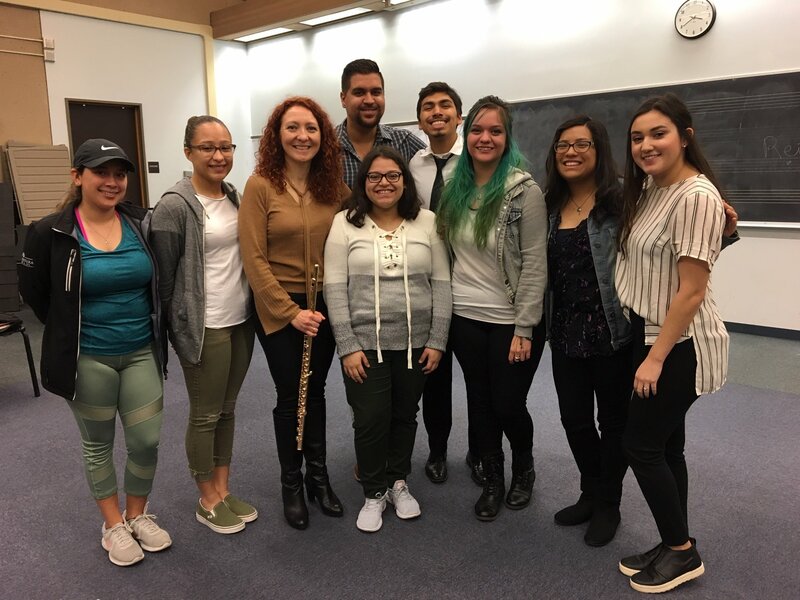 After a brief Q & A session, Eugenia showed the students the score of Matt Dunne’s “Three Artisans” – a tour de force for flute, and demonstrated how she practiced it when she was learning the very difficult piece: using the same methods that she had taught them earlier. The guitar masterclass had about twenty attendees, some of whom came from out-of-town. 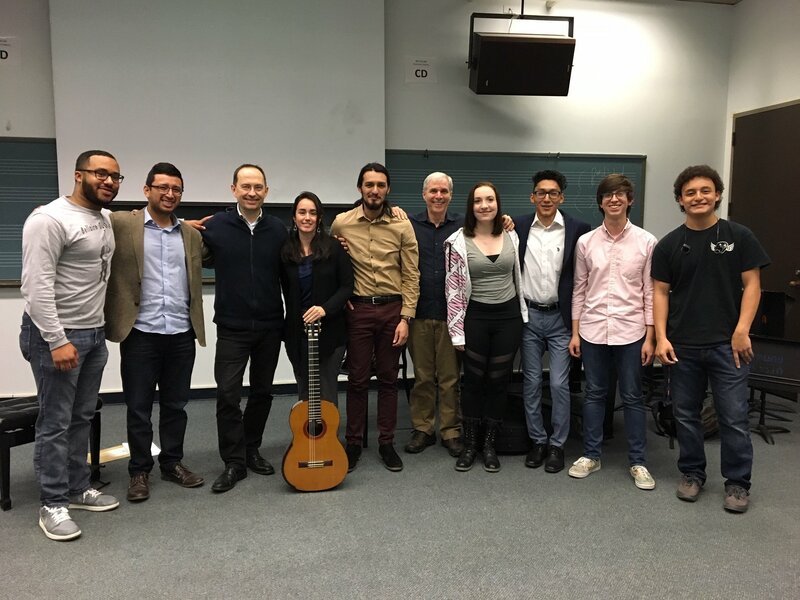 Guitarist Denis Azabagic worked with five students from the studio of Matt Dunne, director of the Guitar Program at UTSA. Similar to the format of the flute masterclass – each of these five students performed a solo piece and then had a discussion with Denis about the fine points of tone production, how to get different colors out of the instrument, phrasing, pacing, and subtle variations in how the fingers can make contact with the strings. Denis had these one-on-one sessions videotaped on his cell phone, and each student was given a copy of his/her session to keep for future reference – all agreed that this was a great idea. During the Q & A session, the class learned that technique is only important because it enables one to do the job of expressing fully what the music is saying, thus concentrating only on technique is not enough – one must understand the composer’s intent before starting a new piece. Both Eugenia and Denis emphasized the paramount importance of listening: not just to music for one’s own instrument, but to all forms of music – instrumental, and vocal. Students were encouraged to attend as many concerts as they possibly can, and to never stop learning – “look to the masters for guidance and inspiration”. The masterclasses went on for almost three hours, and by the end there were only smiling faces.